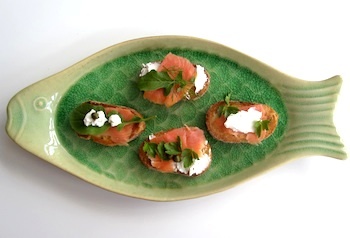 Not only are these bruschetta with smoked salmon and goat cheese (called "chevre" in French) easy to make, but you'll also have fun putting them together. Let your creativity run wild! Bruschetta (pronounced brew-SKET-ta) is an Italian treat made from toasted bread rubbed with garlic, drizzled with olive oil, and topped with whatever fresh and tasty ingredients are easily available. 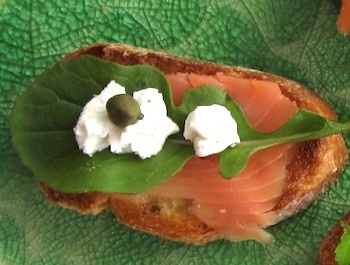 Our bruschetta start with sliced Italian or French country bread, browned for a minute under the broiler, brushed with garlic and olive oil, and then topped with smoked salmon, goat cheese, and other tasty tidbits - arugula, dill, parsley, capers. Nothing could be easier! Serve these bruschetta with smoked salmon toppings as appetizers, or add soup and a salad for an easy lunch or supper. Even though smoked salmon isn't a traditional Italian topping for bruschetta, it gives a flavorful twist to this old favorite. Set your broiler to high. Cut the bread into thick slices - about 3/4" to 1" thick. Unless you're using a baguette (as we did for the photos on this page), cut the slices into half. Toast the bread under the broiler until golden brown - about 1 minute on each side. While the toasted bread is still hot, rub it with the cut sides of the garlic cloves to release the garlic scent. Drizzle or brush one side of the toasts with the olive oil. Now the creative part of making the smoked salmon bruschetta begins. 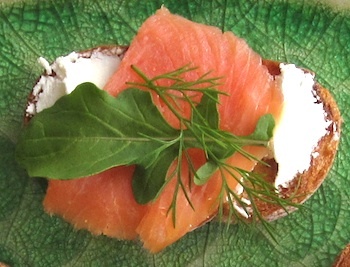 Top each piece of bread with either a piece of smoked salmon, or a thin layer of the goat cheese. Continue adding your other topping ingredients - the arugula, parsley sprigs, dill sprigs, and capers. Have fun and be as creative as you'd like! Or, if you're serving the bruschetta for a family lunch or supper, just put out the ingredients and let everyone assemble their own!